Days before the impeachment referendum against Traian Basescu, the power-struggle between the centre-left government of Prime Minister Viktor Ponta and the centre-right President is fierce. While the government accused Basescu of having overstepped his presidential powers, he in turn accused the government of undermining democracy by attacking institutions such as the Constitutional Court and fostering a coup d’etat. Sorin Ionita, who works for a Romanian think tank, warned that the rule of law is under threat: “There is still a majority of people in the Parliament, in the political class, who do not want an independent judiciary. And the whole story about impeaching the President is looking beyond him. It is about appointing the people in the Prokuratura (judicial system) who are able to guarantee the impunity of the political class. Among the people attending a Basescu meeting euronews met one of his closest allies, Cristian Preda. He is a European Member of Parliament and the vice-president of the centre-right PDL party. Romania entered the European Union in 2007 and now wishes to join the visa-free Schengen area, a step which could be postponed once again due to the ongoing political troubles. The Ponta government came to power in May and tried to reduce the powers of the Constitutional Court which is considered by government allies to be biased, and manipulated by President Basescu. Euronews spoke to Cristian Parvulescu, one of the deans at the “National School of Administration and Political Science of Bucharest. “The personalisation of political life is represented by Mr Basescu,” he said. “He seeks to control politics with authority. That’s why a reform of the constitution is the top priority for Romania. Basescu was elected president in 2004 on an anti-corruption ticket. The former tanker captain was very popular, but having backed an austerity deal with the International Monetary Fund, his popularity melted away. Back in Bucharest, we met Mihail Neamtu the founder of New Republic, a free-market oriented party, launched recently in order to break away from corruption. The political crisis sent the Romanian currency, the leu, to record lows in a country already weathering a recession and where parts of Romania’s business-community are horrified by today’s government actions. According to Mihail Neamtu: “The government is endorsing the position of people who are facing legal, penal and moral accusations. The Romanian government is responsible nowadays for the deepening, for the worsening of the economic crisis. The political turmoil has raised doubts about the future of an IMF-led multi-billion-euro aid deal. When euronews asked Ponta if he would stick to deals agreed with the IMF and the EU he insisted he would, describing them as a “fait accompli”. The former Basescu-backed centre-right government fell over unpopular austerity-measures. But today’s centre-left government has also publicly pledged to stick to austerity measures, in order to calm international markets. Thousands protested in mid-January against Basescu, blaming him for a controversial healthcare bill as well as cuts in pensions and salaries. 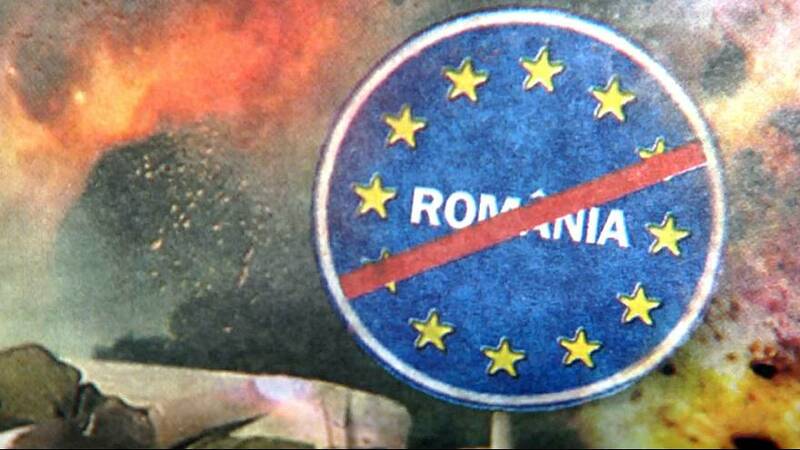 While most Romanians join in the anti-Basescu mood, the European Union insists on fair-play. The Ponta government should respect democratic rules and the Constitutional Court’s decisions and should refrain from emergency decrees as the head of the European Commission representative in Romania, Niculae Idu explained. “The Commission decided to request a new report at the end of 2012, assessing to what extent Romanian authorities have addressed the problems of rule of law and democratic principles and acted to restore the essential checks and balances between Romanian institutions,” he said. European justice ministers will meet to discuss Romania’s request to join Schengen again in September. While technical preparations have been completed, the persisting problems regarding the rule of law in Bucharest could make several EU members veto the enlargement of the Schengen area. Euronews reporter Hans von der Brelie asked the Romanian Anticorruption Directorate (DNA) spokesperson Livia Saplacan about the challenges and results of the fight against high-level corruption. To listen to this interview, which is in English, please click on the link below.